The most important financial news of 2018 was that Modern Portfolio Theory (MPT), the strategic underpinning of prudent investing, worked. Yet you just don’t see front-page headlines saying conventional wisdom worked. Why? Because when what’s expected to happen actually occurs, it’s not news. Nonetheless, the fact that modern portfolio theory worked, just as academia has expected it would, was the most important financial news of 2018. 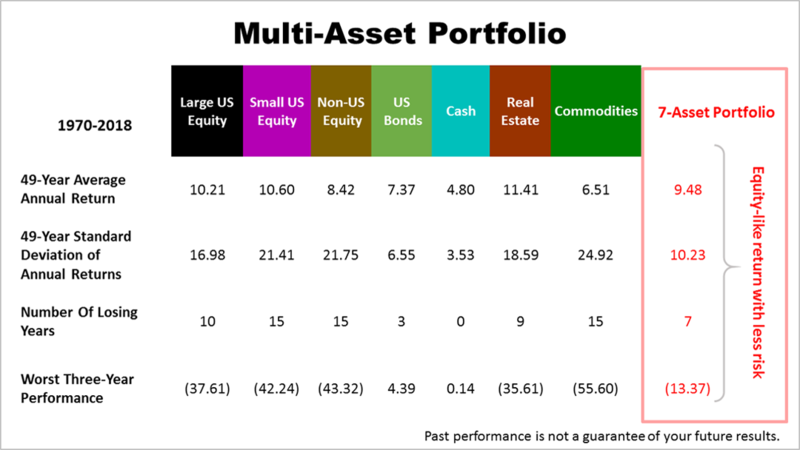 Performance of an equal-weighted portfolio of seven assets for the 49 years through 2018 validated the theory pioneered in academic research in 1948 by Harry Markowitz. MPT holds that a broadly diversified portfolio rebalanced periodically is the best way to get equity-like returns with less risk. The Standard & Poor’s index of the 500 largest publicly-held companies over the 49-years averaged a 10.21% return annually and a 16.98% standard deviation (risk rating), compared with a 10.23% risk rating and 9.48% return on a broadly diversified portfolio. This big news happened in plain sight — as it does every year — and, as always, it occurred so very slowly that it was easy to overlook. Based on monthly portfolio design research reports we license by Craig Israelsen, Ph.D., who’s taught this class annually for three decades, here’s what happened. The 9.48% total return on the diversified portfolio is comparable to the return on a 100% large stock portfolio, the best return of the seven assets, but the diversified portfolio’s risk was much lower. The third-best return across the seven types of asset classes was the 8.42% annualized return on non-U.S. equities, which was an equity-like return, but its 21.75% standard means it carried more than twice the price risk of the diversified portfolio.